Frederick Marquis (Lord Woolton) was born in Salford and educated in Manchester where he became a businessman. In Liverpool he later built up the department store Lewis’s. In April 1940 Lord Woolton was appointed by Chamberlain for a vital task, replacing the Right Honorable William Morrison as Minister of Food. 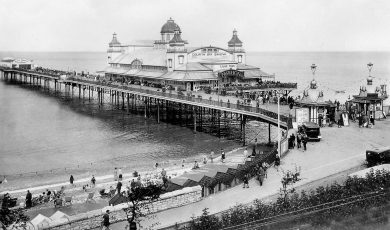 Under Churchill in September the civil servants of the Ministry of Food were evacuated from Whitehall to Colwyn Bay to carry out the function of equal and fair distribution of food and the organisation of its supply. 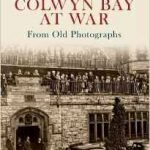 In his memoir in the 1950s Lord Woolton mentioned the town of Colwyn Bay only once in relation to a train journey. Dramatically, he stated that during the war the country never realised how close we were to disaster by submarine peril. During the course of two hours one Friday afternoon he had received five separate signals from the admiralty that food ships had been sunk on the Atlantic route. The implementation of the organisation of food supplies, a vital and complex business, was given importance by Lord Woolton, who in an audience with the King explained the need to communicate to the staff of the Ministry how greatly the morale of the country might depend on them. King George VI promptly visited the London office and followed up with a telegram from the Palace, saying . Lord Woolton, Minister of Food, speaking at Colwyn Bay Food Education week exhibition yesterday warned gamblers in food that he was on their track. ‘These people’ he said ‘must remember that I know something about commercial life, and I am watching some of them. This is the last and final warning that they will get. After all what is the use of making a little extra money llegitimately out of food. It is not going to be of any use to them unless we win this war, and they are not helping us … Why are they allowed to exist? … because they are like the worms of the earth. They slither along and go underground. LordWoolton’s Final Warning To Gamblers in Food . From the North Wales Weekly News 8th May 1941. An ésprit de corps was created. 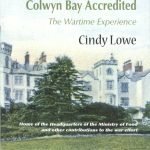 There were regional and local food offices But the headquarters of The Ministry of Food was at Colwyn Bay. 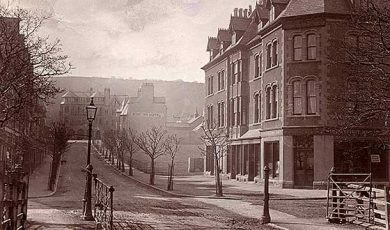 Lord Woolton stayed at the Station Hotel Llandudno Junction, but travelled to his office at the Colwyn Bay Hotel by train. He took the view that it was insufficient to impose restrictions but that a programme of advertising to support it was undertaken. There were many new recipes made out of the restricted supplies, including the “Woolton pie” named after the minister, which consisted of carrots, parsnips, potatoes and turnips in oatmeal, with a pastry or potato crust and served with brown gravy. This recipe was devised by a chef at the Savoy. It was Woolton’s business skills that managed to make the Ministry of Food’s difficult job a success and he engendered a strong personal popularity despite the shortages. 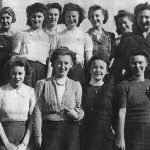 Woolton Pie, is an excellent example of how people coped with rationing. Fats, such as butter and lard, were rationed, so everyone had to find ways to make these last. The government issued many recipes to show people how to make meals with very limited ingredients. Potato pastry uses very little fat as the potato makes the pastry moist and crumbly. It was difficult to work with and turns grey if left too long when it’s made. The pie contains seasonal vegetables; many of these would come from gardens or allotments because people grew as much food as they could. The government encouraged this with ‘Dig for Victory’ campaigns. Lord Woolton was replaced as Minister of Food in 1943 and transferred to become Minister of Reconstruction. From Colwyn Bay Accredited. Cindy Lowe.